I’ve been in Mongolia for almost two weeks at this point, and I am only now finding time to write about life since graduation. You wouldn’t think that integrating into a community between classes would leave you without any free time, but boy would you be wrong. For now though, that’s beside the point; the important question is: how did I get to this beautiful country? The week that I arrived was probably the busiest week of my life. Within 6 days, I went from being a college graduate in Pennsylvania to a Peace Corps Trainee in Mongolia. Graduation was a joyous experience. I saw my sister and her family, as well as my best friend for the last time before Mongolia. The thrill of meeting my college friends’ families and seeing my best friends from home and school in the same location, enjoying each other’s company was exhilarating. It was extremely tiring as well. I think I got a maximum of 5 hours of sleep if that each night. Plus, leaving for Ohio as soon as graduation was over, just to finish packing so that I could fly out with my parents to San Francisco was a lot to handle. Luckily, we were troopers, and got through the travelling without too many hiccups (although one of my bags did break). After arriving in San Francisco, my parents and I walked across the Golden Gate Bridge, ate a plethora of various foods, were happily surprised to receive free admission to Muir Woods National Monument, and continued packing and repacking my new suitcase. When our time together drew to a close, my parents left without a tearful goodbye (that had happened in Ohio when we realized I wouldn’t be coming back home). Then, it was time for Staging. Since I was in San Francisco before Peace Corps events began, I met up with some other Invitees to explore the city. I saw the Golden Gate Bridge (twice in a week, really racking up my tourist points) and went to a tea garden. We also had sushi for the last time for most likely a long time considering Mongolia is a landlocked country… Then we went back to the hotel to begin the ambiguous and ever-elusive event known as Staging. It turned out to be exactly what you’d expect: ice breakers, Peace Corps history and expectations, and a brief introduction about what to expect from Mongolian culture. We were lucky that a 3rd year recently returned Peace Corps Volunteer (RPCV) decided to join us. That poor RPCV; we interrogated him for hours. After the first evening, most of the volunteers went out to explore San Francisco and get to know one another. Then we went back to the hotel to get some sleep to prepare for the grueling day ahead of us. After the only full day of Staging, some Invitees went to buy last minute supplies, while most spent hours repacking their suitcases to meet the weight limit. had a wonderful last dinner at a Yemeni restaurant. Most Invitees ended up going to bed late, even though we had to be down in the hotel lobby by 4:30 am… I Surprisingly, this international trip was one of my easiest to date. We took a charter bus to the airport and got dropped off at the domestic terminal. Who knew that this mistake, which ended up requiring all 61 Invitees to walk to the international terminal would be our only form of exercise for the next 31 hours. After checking our bags and checking-in for the flight (we definitely created a traffic jam… such a long line), we played the waiting game as our plane didn’t leave until 10:50 am. After that we had about 10.5 hours to sit on the plane and get to know the Invitees sitting on either side of us. Luckily, the flight passed quickly with conversation, movies, and periods of sleep. Upon landing in South Korea, we quickly had to figure out where to check-in to receive our transfer tickets for the flight to Ulaanbaatar. One of the Invitees speaks Korean, so with his help we were able to swiftly navigate to the transfer desk. Conveniently, the complimentary showers were about 20 feet from the transfer desk. A small towel, soap, and shampoo were provided for each traveler in the shower rooms. I was the second Invitee to get in line, so I had an extremely short wait. Each shower room even provided a new disposable toothbrush! This was the cleanest and most refreshed I had ever felt after a long day of travelling. After the shower, one of the other Invitees and I got pho, and then I took a nap before the flight to Ulaanbaatar. On the flight, all the Invitees were split up. It turned out that 13 Invitees had to stay in Seoul for the night and take the flight to Ulaanbaatar the next day as they had not been confirmed for tickets on our flight. I ended up sitting next to a 45-year-old man from England who had been living in Mongolia for the last 4 years and in Asia for the last 17 years. He had a lot of interesting advice about the culture that I had not yet heard or read online. He also recommended an app (WordPower) that is really helpful with the Mongolian language. Once we landed in Mongolia, we went through customs and picked up our bags (no bags were lost, imagine that!). Then, we met up with Peace Corps Mongolia officials who ushered us to the bus. From there it was an hour drive to our hotel on the outskirts of Ulaanbaatar. The next day, we had a late brunch (thank you Peace Corps for giving us time to sleep in). Unfortunately, due to the early sunrise, most Trainees (now we’re called Trainees since we made it to Mongolia, woohoo!) woke up around 5 am. Peace Corps was clearly slowly letting us adapt to Mongolian life as our hotel in San Francisco had been beautiful, and this one still had bathrooms and running hot water. Plus, the food was a mix between Europeanized Mongolian cooking and American breakfasts including eggs and bacon. We even had Wi-Fi (hello snapchat streaks). Thus, began our orientation period in Mongolia. Over the next five days, we learned about Peace Corps policies in Mongolia, how to stay healthy and safe, and had culture lessons. We also received vaccinations for rabies, ticks, and typhoid… Many speakers were also invited. One of the most interesting sessions was when five current PCVs came and spoke to us about various topics. 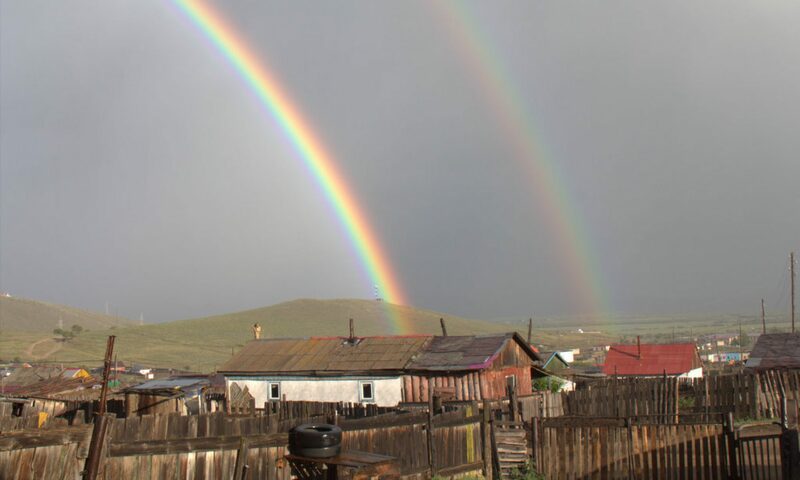 There were two volunteers who discussed life in Mongolia as an LGBTQ member. Since it is not really accepted in Mongolia, they said over the last year or two years, they have only come out to a maximum of three people. This usually occurred because the people somehow found out, either from using their computer or because they guessed and were surprised by the response. In addition, accidentally outing someone can occasionally cause problems for PCVs as news spreads quickly in Mongolia. There were also two volunteers who discussed life in Mongolia for PCVs who don’t look like the stereotypical “American”. One volunteer is Hispanic from the Dominican Republic, but many Mongolians think he’s from Africa and always touch his hair. The other volunteer is Korean American, so Mongolians were constantly surprised at the beginning of her service about why she can’t speak Mongolian well as they assumed she was a native Mongolian. The final volunteer was a 72-year-old PCV who discussed how life is different as an older volunteer. She said that since respect for elders is prevalent in Mongolian culture, it has been easier for her to be heard by her community members as she doesn’t need to prove her ideas are worthwhile. This session really gave some valuable insight into some aspects of life in Mongolia that I had not really considered. Two days before leaving, we were given our training site locations. I practiced my family members’ names with some of the Mongolian officials in Peace Corps Mongolia. Most Mongolians have a two-part name. For example, one nurse is named Stone-Flower. Typically, the easier half is the name they go by with foreigners. We’re split up into two regions which each meet once a week for Medical and Safety & Security sessions. This means that the half of the Trainees in the same region will see each other, but the two halves won’t meet up until the end of the three months when there are three days of closing ceremonies. At this time, we will also meet the Training Managers (sort of like school principals) for our respective permanent sites. Three months seems like a long time to live with a host family without seeing many of my friends, but I’m sure it will pass quickly.